Halley's Comet in 1986, as captured by astrophotographer Victor Rogus. This photo won Astronomy Magazine's "Best Astrophoto Award" in the August, 1986 issue. Victor Rogus is an amateur astronomer, and this is the first in his series of exclusive Space.com posts about amateur astronomy. He contributed this article to Space.com's Expert Voices: Op-Ed & Insights. April 8th is my father's birthday, but in 1986, I was not with him or the rest of the family back in Des Plaines, Illinois, celebrating with him, and enjoying a slice of his favorite cheesecake. That year, my wife and I were nearly 1,400 miles away, standing on a beach of crushed coral. We used a public pay phone to wish him many happy returns. With sincerity he wished us the best of luck on our adventure. We were far from home getting ready to photograph the historic Comet Halley from one of the best locations in the United States: the Florida Keys. At latitude of 23 degrees north, we would enjoy a distinct advantage over other astrophotographers. We were excited with the promise of new stars to see in the dark skies over the Straits of Florida. As mile blurred into mile and hour blurred into hour it seemed nothing could detour us from our grand undertaking. After a brief tour of Key West we decided to find a comfortable campground where we would set up our equipment and try to get some rest. Retreating a few miles north, we settled on Lazy Lakes Camp on Sugarloaf Key. After checking in, we slowly drove to our campsite. We passed a huge 12-inch Newtonian telescope on a massive mount staring at the azure sky, its owner nowhere in sight. In the campsite across from ours, our next-door neighbor tinkered with his 8-inch Schmidtt-Cassegrain. It would seem we were in the right place! With our camp made, tent erected, van organized and telescope set up, we settled in for dinner. Our next move would be to Polar-align our telescope's homemade mount, locate the great comet and perhaps begin photography. The manager of Lazy Lakes Camp on Sugarloaf Key makes life easier for the Halley's Comet hunters in 1986. As darkness fell we waited in hushed anticipation for the most famous snowball in history to appear. Then, a moment after the great orange globe of the sun slipped below the western horizon, a loud BUZZ-CLICK was heard and we were bathed in a sickening yellow light from an unnoticed street lamp directly across from our campsite. Photography was out of the question for tonight. Bugs danced and played around and around the street lamp, each a micro-comet unto itself, in orbit around its quartz-halogen sun. We had driven nearly 1,400 miles to see and photograph history's most famous comet. The same one that William the Conqueror was said to have seen and took as a sign to invade England in 1066 AD. We would not be stopped by a light bulb. I had a slingshot and was good with it. Maybe no one would notice the sound of the glass breaking. We talked about using the van as a makeshift light stop but the light was too high above us and too close. Before us lay a salt marsh, behind us a small bay, so moving did not seem a very appealing prospect. Besides, we were all set up and ready to Polar-align, and it was getting dark fast. We decided to do the right thing and speak to the caretaker of this facility and offer him a bribe. The next day I walked up to the front office where I explained our predicament. At first the campground manager could not believe that one little light bulb was going to ruin my Florida vacation. Taking out my wallet I laid a $20.00 bill on the counter. He looked at me and said, "You are serious aren't you?" "Yes sir, I am." I replied. "OK" he said, "I'll see what I can do." I hurried back to our campsite not sure what to expect next. A few moments later I saw a small bulldozer making its way towards us. The machine rumbled and belched oily smoke as it approached. My wife asked, "What did you do? Call out the Army Corps of Engineers?" Climbing into the bucket of the bulldozer, the camp manager raised himself up and unscrewed the offensive light bulb. With the job well done the camp manager walked over and handed me my $20 bill. He said, "You can keep your money but if you don't mind, I sure would like a look at that comet everybody is talking about." Pointing to my telescope I said, "I can give you a great view!" Then I told him to come back at about 2:00 a.m. and we would treat him to the show of a lifetime. "2:00 a.m.! ?," he gasped. "I don't want to see it that bad!" He then climbed back onto his machine and drove off. "Thanks a lot!" We called after him. With the problem of the glaring light finally settled and the radio predicting clear skies, we knew we would do what we came to do. We were ready for a big night as it was the Night of Comet: Halley's closest approach to Earth . It would be about 39 million miles away from us at its predicted peak brightness. Most experts felt it would be 2nd magnitude or brighter and could be sporting a tail as long as two-dozen degrees long. The experts were right about the magnitude estimate but wrong about the tail length. The shortness of the tail did not matter to me. We were there, and we had our work cut out for us. We were going to try to document this historic moment to the best of our ability. Everything was beginning to fall into place. We had glimpsed the comet the night before, but I was too preoccupied with the glaring light bulb to enjoy it. 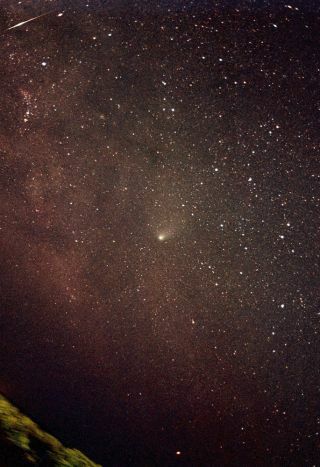 Now, the hour was upon us and we had Sir Edmund Halley's Comet in our finder scope. Soon we had begun to make wide-angle images with a piggybacked camera. Over the course of the night we made a series of photographs using a 50-millimeter f 1.8 lens on KODAK VR 1000 ASA color print film. Exposure time ranged from 10 to 20 minutes. A simple plan, but one we were comfortable with. The next morning we considered what we had done, we made our exposures and thought it might be time to break camp and start heading home. Throughout this trip, the Florida heat and humidity had been oppressive and sleeping during the day was difficult at best. Small, fast lizards sprinted past the door of our tent and for this reason, my wife preferred to sleep in the van. I found the van akin to some type of large pressure cooker and tried to find comfort outside with the lizards, as slight buffs of hot, humid air teased the flaps of my tent. We were sunburned; even the tops of our feet were red. Fatigue was beginning to eat away at us, and we still had the long drive home. Worst of all, the radio's weather report was beginning to tell of approaching storms. After some discussion, we decided to indeed dismantle the campsite and weather the storm in the van. A night my wife and I will never forget. Huddled together, we watched as the driving rain and wind of this springtime storm slashed at our campsite. While the storm raged, we tried to rest in our crowded vehicle. Weather reports were not looking favorable for the next couple of days so we decided to head back to the mainland. Once there, we would find a custom photo lab, have our film developed, and if we were satisfied with our images we would be on our way to Disneyland. Back on the mainland, we happily checked into a nice hotel. Consulting the phone book, we found a local photo lab that would process our film. We explained to the lab's proprietor that the film contained star images. (This was always a good practice, since sometimes the lab technicians would not print film of this nature thinking there is nothing on it but faint specks.) Alas, those were the days of film photography. We drove around town looking for brunch, just killing time while our film was being developed. Soon, it would be ready and we could inspect the quality of our work. Back at the hotel, we cleared an end table and laid out our images. There it was, centered neatly in each frame, the object of our desire, Halley's Comet. One of the frames even contained a bright meteor trail! We didn't know it at the time, but that photograph was to win Astronomy Magazine's "Best Astrophoto Award" in the August, 1986 issue. This would be the catalyst that would launch me on a lifelong love affair with the sky. In 1986, I was 26 years old. I had been interested in science and nature my whole life. Art and photography were also of keen interest to me. At the time, I was working in a graphic arts department as an artist. Having also worked professionally as a photographer, astrophotography seemed like a natural choice for me. My family owned a small machine shop, a trade that would punctuate my career time and again in ways too many to list. My machine-shop skills allowed me to design and build my own photographic systems such as telescopes and camera trackers. Indeed, a machine shop is a great thing to have when building your own equipment, but it is not a necessity. Just two years before, I had purchased my first astronomical telescope and was really just learning my way around the sky. This trip was my first expedition to photograph a major astronomical event. This excursion was going to put my limited experience to the test. The outcome could not have pleased me more. But, the big thing I learned from this adventure was that the sky does not care who you are, or where you went to school, what you do for a living or what kind of car you drive — these things do not matter. What does matter is that the secrets of the universe reveal themselves to those people who care. These amazing sights were here for all of us who go through the pains of being where they need to be to see them and participate in their passing. My Grandmother had told tales of Halley's Comet, and how people had killed themselves rather than suffer the effects of cyanogen gas as the Earth, in its orbit, passed through the comet's tail. I wanted to see this mysterious passing specter of the night. I wanted to photograph it, and understand it, and become closer to it. Now, there would be no turning back. This early success would fuel me for years to come. I would have many more adventures in outer space, traveling by way of my scientific equipment, bound only by the limitations of my imagination and the border of the visible universe. Space.com is hosting a slideshow of Rogus' night sky images.